There is a Star Wars “Welcome Home” variant that I really want! Poor Kitty, on her way to save Quill, crashes space Quinjet. Good thing Lydia, Quill’s fancy space ship computer, comes along to pick Pryde up. Lydia tracked her using the Kitty phone, that’s how they are going to locate Quill. A fun drinking game could be to drink whenever Kitty states she hates space. 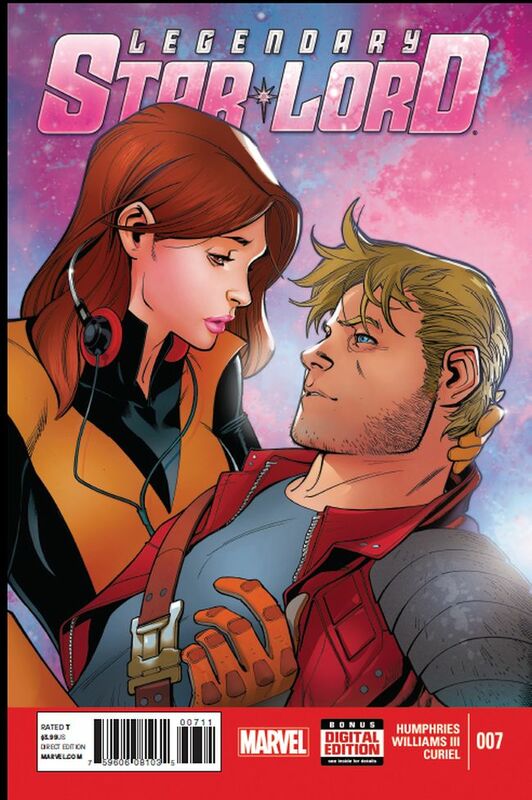 Pryde doesn’t admit that she is in love with Quill, it is way too early for that. I like Kitty petting Lockheed, he isn’t being forgotten in the scene. 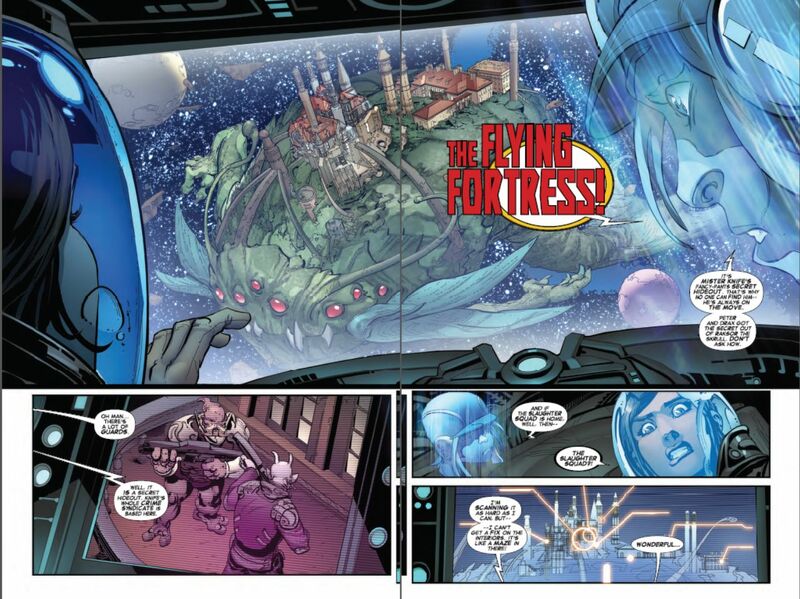 J-Son’s base is called, the Flying Fortress. That is how he is never caught, he is constantly on the move. He is very well protected, his has an entire criminal syndicate plus the Slaughter Squad. Pryde didn’t know that was their name. Pryde has to explain that her powerset is to be intangible, not invisible. Is there anything better than Lockheed on Kitty’s shoulders? I don’t believe so. 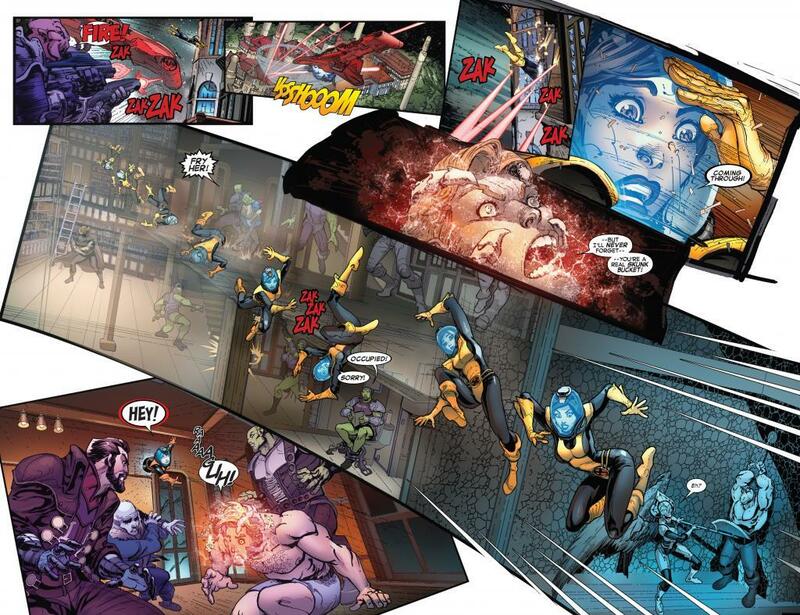 Pryde is regretting not getting the Guardians or the X-Men involved. She’ll learn from this when it comes to Black Vortex. Pryde wanted to save Quill so much, that she left without a real plan. 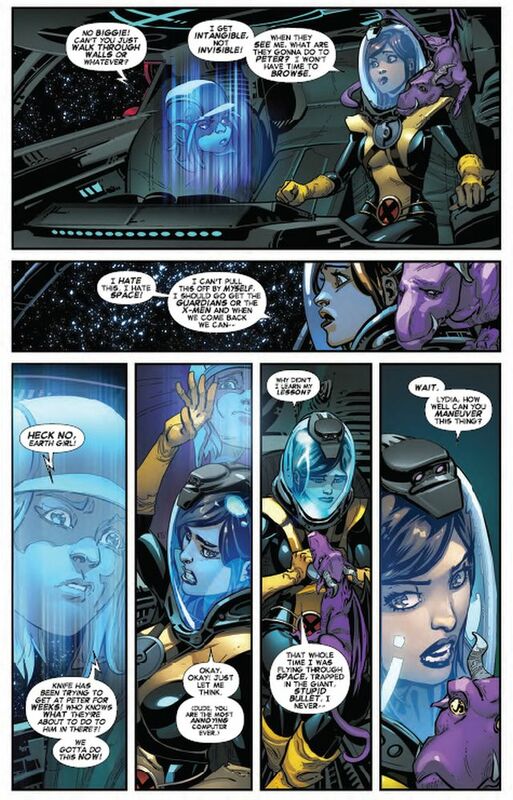 Pryde reflects on her time in the bullet, and comes up with a plan that involves Lydia having to maneuver the ship (herself). I really like that panel of Kitty and Lockheed looking at each other. Meanwhile inside, Quill is down to his boxers. J-Son is taunting him, he wants to punish his son for making him restart his empire from the ground up. J-Son isn’t going to kill his son, he is going to make him suffer but first he is going to brainwash him. Pryde’s plan is to rush the ship and phase into it. I like that she tells Lydia to watch over Lockheed, which is a shame as she should take him into battle. 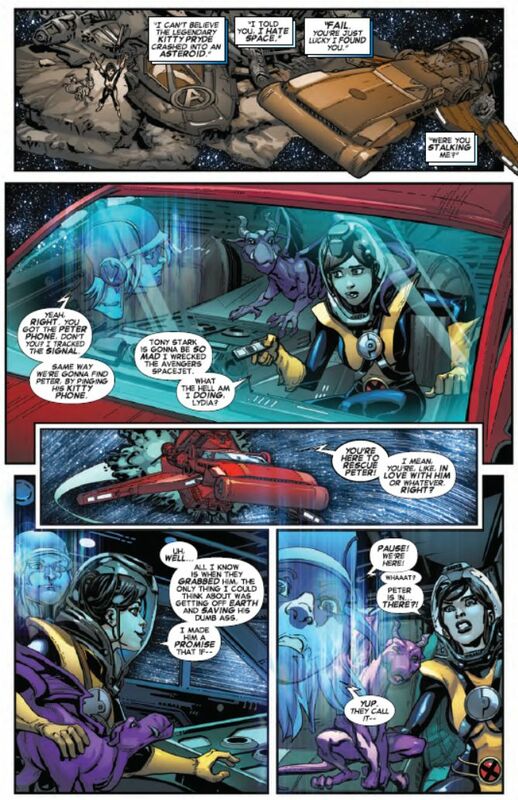 Lydia slams the breaks and Shadowcat is in deep space. Williams does a great job of showing how fast she is going with how many places she phases through. Great use of the double page splash. 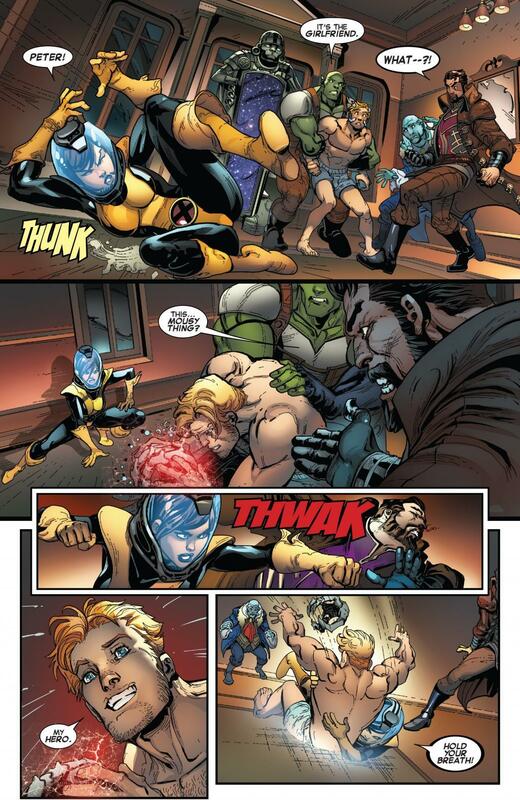 The Skrull does a horrible job of introducing Pryde to J-Son. He calls her, a mousy thing, and gets slugged to the jaw for his troubles. 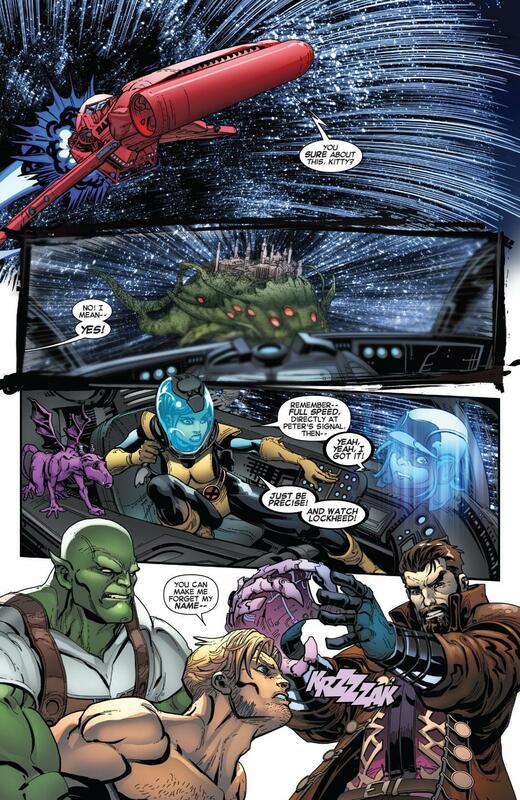 Pryde tells Quill to hold his breath, as they keep phasing through the ship. Pryde has saved Quill, yet again – this time, in person. Lydia flies by and picks up the two love birds. I guess that makes sense that Lockheed didn’t come along. She was snatching and grabbing. I suppose he was along for the ride to give Kitty someone to speak to. Quill recognizes that Pryde hates space (drink!) but she is a woman of her word. 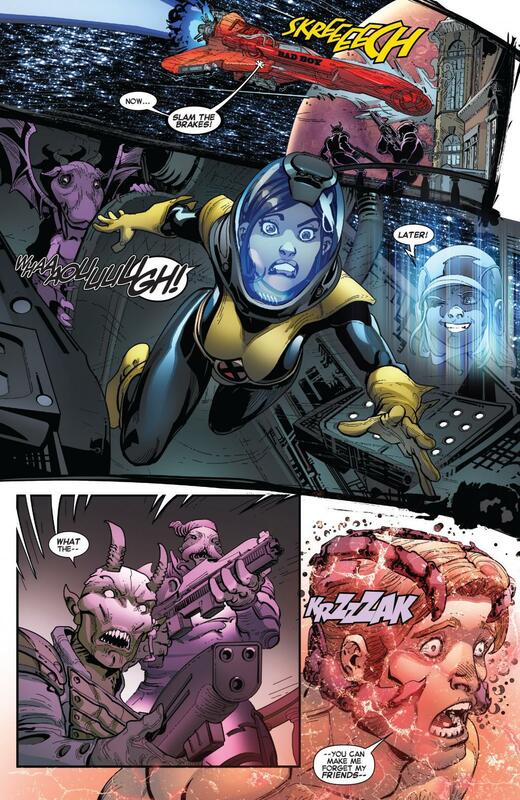 Shadowcat did travel a billion light years, so if the gal wants some space sugar, give her what she wants! Quill gives it to her! Quill sets Lydia on course for Ma Savage’s on Spartax, they are gong to have a real date! Misa, of the Slaughter Squad, is hot on their trail. Brennan-7. A Dirty, Dusty Planet. J-Son orders all of his guards dead, for allowing Quill’s escape. Bligh updates J-Son on his investments, business is good. J-Son has come to meet . . . Thane, the son of Thanos! Which is how the issue ends. 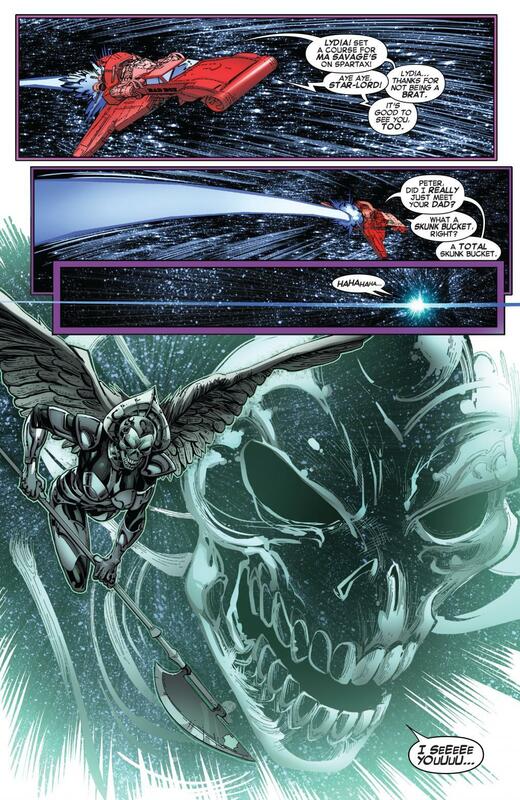 Thane is the new character find of Infinity, which makes sense as Black Vortex is coming around the corner. This is literally one the best issues I’ve read in a while! High Note.